Typhoon Sanba has taken shape east of the Philippines, forecast to enter the northern part of the Truong Sa (Spratly) Islands on February 15 to become the second storm in the East Sea this year. However it is forecast to weaken at sea and not to affect Tet celebration in the mainland of Vietnam. According to Mr. 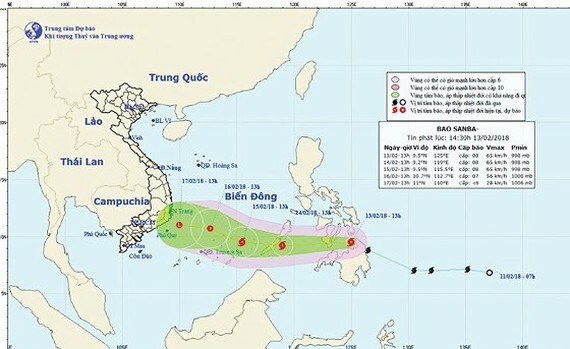 Le Thanh Hai, deputy director general of the National Hydro Meteorological Forecasting Center, the typhoon will not much affect the weather in mainland Vietnam in days before and during the Tet festival. The typhoon is forecast to move toward the northern part of the Truong Sa Islands and enter the waters off the south central region of Vietnam. At that time a northward cold front will slam in and weaken the typhoon at sea. European forecasts also say that the storm will approach the south central coast but it will soon degrade. However, the islands area and the southern part of the East Sea will be rough and choppy with big waves and strong winds, dangerous for boats. Therefore, it is needed to call on fishing boats to move out from the area and seek shelters, said Mr. Hai. During the Tet holiday, the northern region weather will be cold, drizzly and suitable for Tet celebration and spring travel. Mountainous provinces will be very cold under influence of cold fronts. The central region will be different from previous years. Rains will occur in south central provinces before Tet and in north central provinces after Tet. The Central Highlands will will see unseasonable rains on February 15-16. Southern province will be dry with only some places seeing unseasonable rains in some days during the holiday. It will be hot in the remaining days. 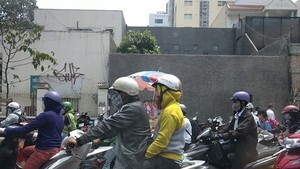 Temperatures will soar to 33-35 degree Celsius in HCMC. Those liking cold weather and spring rains can travel to the northern region while those in favour of warm weather can move to Vung Tau city and Phu Quoc island.